Wow, I can't believe it's months since I said hi to everyone. Sorry about that. I have been bogged down in a writing frenzy to finish and edit The Jewel of St Petersburg - already way over its deadline. For me that's the toughest aspect of writing, the need to meet your publisher's schedules, though I have to emphasise that both Little Brown UK and Berkley US have been sweetness itself in accommodating my tardiness. It's just that some books take longer to emerge than others and it's hard to know quite why that is. I met someone at the RNA Awards Luncheon in March who writes three books a year and I was nearly sick with envy at the speed of her writing! I've loved the shift of mood in this book. So different from the harsher Stalinist regime of my last two books. I relished the delight of immersing myself for a change in the lavish lifestyle of the final glory days of the tsarist regime in Russia. It was an extravagant and decadent world of self-indulgence and gaudy excess, of Imperial balls, glittering diamonds and romantic sleigh rides - a sharp contrast to the privations of the underpaid workforce. The Jewel of St Petersburg opens in 1910 with a catastrophic event in the life of young Valentina Ivanova and progresses to the moment when the Russian Revolution explodes throughout the elegant city of St Petersburg with the firing of the signal gun from the ship, Aurora, in 1917. The book explores how Valentina, a privileged young woman and talented pianist, fights for her independence and falls in love with a Danish engineer, instead of the Russian Count her parents have planned for her. Valentina tries to protect her young sister from the tumult sweeping the city, as Tsar Nicholas, the Duma and the Bolsheviks are at each other's throats. But tragedy strikes and she is forced to look at her world and herself with new eyes. I could go on - but then you wouldn't bother to read the book! Suffice to say it's a story of passion and treachery set against a backdrop of danger, of secrets and lies interwoven into the fabric of a Russian society about to tear itself apart. And isn't the cover gorgeous? As lush and lavish as the world it describes. Berkley have promised me a preview copy of it this week, and however many books I write, however many times I repeat the experience, holding that first copy of the book in my hands gives me a visceral thrill that doesn't dim. This business of writing is truly an addictive occupation. Brilliant! I can't wait to read the new book. I myself have difficulties with deadlines and their frequency, yet do not know if its a comfort or challenge to learn it does not get any easier!? P.s Love the cover. Kate, I can't wait for this book to arrive in NZ!!! Deadlines certainly get our adrenaline flowing - we all can sometimes produce our best work under pressure, as I'm sure you find. Apparently different parts of the brain come into play when we're under stress and that creates a whole new take on the work. Good or bad? ... you choose. Glad you like the cover. Gorgeous! I can't wait to get hold of it, and I like the idea of going back to just before revolution! Looking forward to reading it. How's life in Oz? Have you got a stack of books in ready for the onslaught of football at the World Cup next month? I've recently been asked by my publisher to read and review a new novel called 'City of Veils' by Zoe Ferraris. It's a crime story set in Saudi Arabia and depicts brilliantly the limitations on the lives of women in that part of the world. Very intriguing. One of the interesting aspects of the job for authors is when we are asked to comment on new writers' works. I am always scrupulously honest in my response, but I like it when I can give a useful quote for the cover to help out a new writer. It's tough out there. Hi Kate, I read all three of your books over the last 3 weeks...now I am like a druggie, needing a next big fix! I enjoyed all three, and hope to reread them one day. Under a Red Blood Sky made me cry in parts, ah, the human suffering, mostly untold. In China, it was the same. In the Concubine's Secret, I somewhat wished Alexei would be Lydia's for keep, I somehow see him more suited to Lydia, for some perverse reason, knowing now that he is not she thought she was. Ah, being a Chinese and married to a Kiwi, I know the cultural difficulties of a cross-cultural marriage...but it can work, with a lot of tolerance, I think. Re Lady Lavender, it is something my then 10 yr old daughter dreamt up for me. I have a blog, after the name, built as an outlet of sorts. Interesting idea of Lydia ending up with Alexei. Don't think I wasn't tempted - but that would mean Chang An Lo would have to die and I couldn't bear to kill him off. But there's always the next book .....! I'm not sure when JEWEL will be released in Europe - I believe it's in large format from June, and in normal paperback size from November. Hope you find it - and more to the point, enjoy it! Just ordered your book on Amazon and am waiting rather impatiently for them to deliver it. I'm so excited! I get excited myself at the thought of JEWEL winging its way into readers' homes and into their heads. Hope you enjoy it and make the connections with my other books - some rather unexpected! It warms my heart to know you liked the new book and are eager for more. My next book will actually be in a totally different setting and about different characters, to be published next year, but I am still playing with more ideas for Lydia and Chang. So watch this space! You're a glutton for Lydia's story! I hugely enjoyed writing those books, so it's great to hear that they resonated with you. 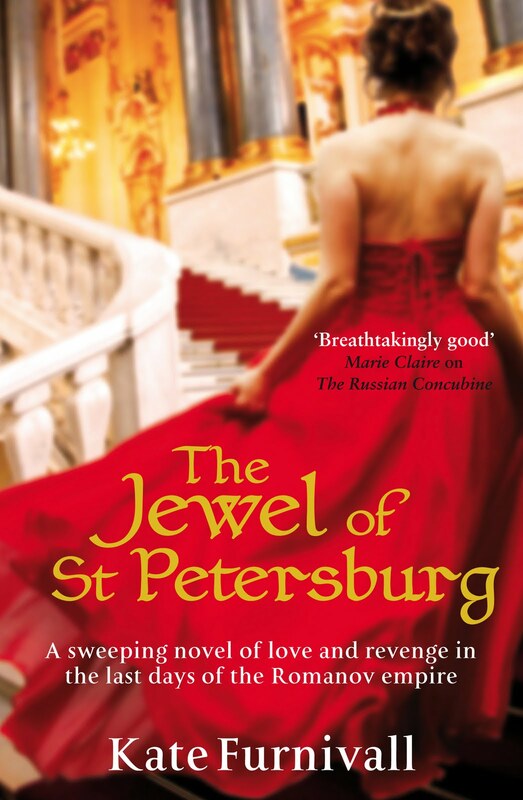 My new book - THE JEWEL OF ST PETERSBURG - follows Valentina's life before the Russian revolution, and as I said in my reply to the previous post, my next book will be set elsewhere. But never fear, I'm sure Lydia will return! I just finished your book The Russian Concubine....please tell me you will be writing a sequel to this wonderful book! This would make a great movie. Great to hear you enjoyed The Russian Concubine. I based it on my grandmother's situation of being a White Russian who escaped to China - though Lydia's story is totally fiction. I have already written a sequel to it - it is published as The Concubine's Secret in the UK but published as The Girl from Junchow in the US (can't tell where you're from). Enjoy it. Yes, a film would be fantastic but Steven Spielberg hasn't yet called!